How to enable a teacher's Admin rights, reviewer settings and approval settings. 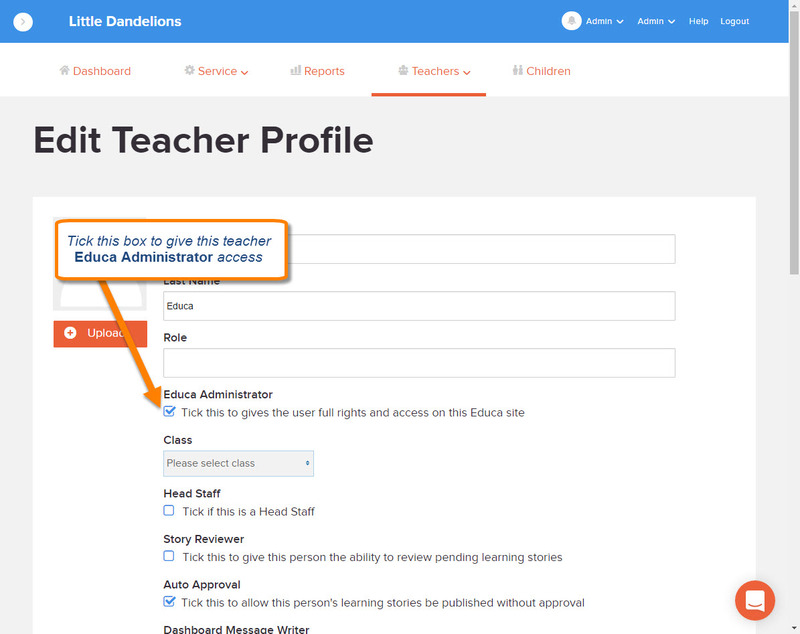 If you are a Staff member with administrator level access, and you would like to give another teacher the same access, you can do this by editing their profile settings. If you have never edited another teacher's profile, we will explain how to here. Please note that administrator level access is the highest level of access which a teacher can have on the site. It means they will be able to edit other teacher profiles, edit site settings, and more. 1: Click the Name of the teacher who you would like to assign these rights to. This will bring you to that teacher's profile page. 2: Click on "Edit Profile"
3: This will take you to the following page where you can edit another teacher's profile information, and access. Tick the box under "Educa Administrator" as shown below. 4: When you are done editing the Teacher's profile, remember to click "Save" before you leave the page so that your changes are saved. Please note: If the teacher is logged into Educa while you change this setting, they may need to log out and log back in for the system to fully recognise this change. There always needs to be at least one teacher with administrator level access.